Mark Alan Timcheck, 16, of 154 Kenney Drive, Sewickley, died September 5, 1977 in Mercy Hospital, Pittsburgh, from injuries he suffered in a fall August 16. Born September 26, 1960 in Sewickley, he was the son of Paul E. and Terry Timcheck. Mark was a lifelong resident of Sewickley, a member of St. James Catholic Church, and a senior at Quaker Valley Senior High School, where he was a member of the track team, chorus and an honor student. He was given the Kiwanis Award in 1975, and had just been appointed the QV representative to the Kiwanis Rotary Club. 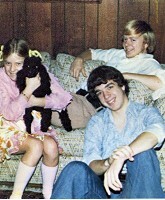 In addition to his parents, Mark is survived by two brothers, Michael and Paul E. Jr., and a sister, Tammy, all at home; his maternal grandparents, Florentine and Hildegard Nachtway, of Mamburg, Germany; and paternal grandparents, John S. and Mary Timcheck, of Washington, D.C.
Friends were received at the Richard D. Cole Funeral Home. Mass of the Christian Burial was celebrated September 3 by Father Leo Burchianti in St. James Church. Burial was in St. James Cemetery. How does one adequately extend gratitude to so many fo(r) so much in time of such dire need? Not to everyone in general but rather to each of you in particular, we offer our heartfelt thanks for the beautiful floral tributes; the thoughtful mass cards; the food in great abundance and the gracious service which accompanied it; the condolences exquisitely expressed in cards, notes, and letters; the eloquent eulogy; the touching message from the Class of 1978; the warm words and loving embraces of comfort from all who visited us in our bereavement. To you-our relatives, our neighbors, our fellow workers, our classmates, our friends we shall forever remember that you remembered. I worked with Mark (and Sonny)during the summer at the high school. After all of this time it is hard to believe he is gone. He was kind and gentle. I bet he would have made a great father.